Recently got some new leg braces to replace the old ones that kept breaking repeatedly. Every week to two, I would need to schedule an appointment to get the old braces fixed. I visited two different locations of a huge orthotics company and was told by folks both locations that they had never seen someone break the braces as often as I did. So they were always asking me what I was doing and my response was that I was just walking. But when they started asking me how much I was walking they began to understand why the braces kept breaking. Below on the left you can see the old braces -- they have a plastic food bed and calf support with aluminum struts along each side. The new braces are one continuous plastic mold. The new braces have absolutely no flex to them whatsoever. By contrast, the old braces had enough joints that the large amounts of movement had kind of worked them somewhat loose giving them the feeling that there was at least some flex. In fact, with the old braces, I even broke the aluminum struts ... twice. The first break of a struts involved a big chunk of the aluminum just popping out while I was out on a walk around my neighborhood. This meant that the ankle on that side was free to move which my body was too weak to handle and I had to ask a neighbor for a ride home. The second strut break occurred while I was out walking and it just snapped in half. Although it took me a while, I was able to hobble home on my own. But then I had to cut a ruler in half to splint the strut and wrap it with a bunch of duct tape so that I could keep walking until they could order a new strut. These two breaks really surprised the orthotists! 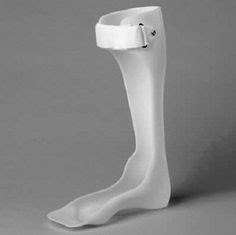 Now I am learning to walk in these new braces which is quite a challenge. I have more stability with the new braces but they are much more rigid. So the motion is different. At any rate, I am already happier with the new braces because they don't feel like they are going to fail at any moment. I am so thankful that I am fortunate enough to no longer be in the wheelchair, that I can actually walk, even if it is with arm crutches. Small improvements every day amount to big improvements over time. This is now my goal -- small, continuous improvements.